We love butter, ghee, tallow, lard, and all good and natural saturated animal fats! If you follow our recipes you know that we also eat cookies, brownies, and muffins. These are always gluten-free, relatively low in carb content (we never add sugar), and usually high in good fats. They are always Primal but not always Paleo, click here for a post that describes the difference between these two approaches! Desserts are not the staples of our diet and we encourage you to exercise restraint with your consumption, especially if you are trying to lose weight. It’s too easy to over indulge, especially when you tell yourself its “OK” because they are made with healthy ingredients. Still, it’s nice to be able to have them once in a while, and our dinner guests always love them. 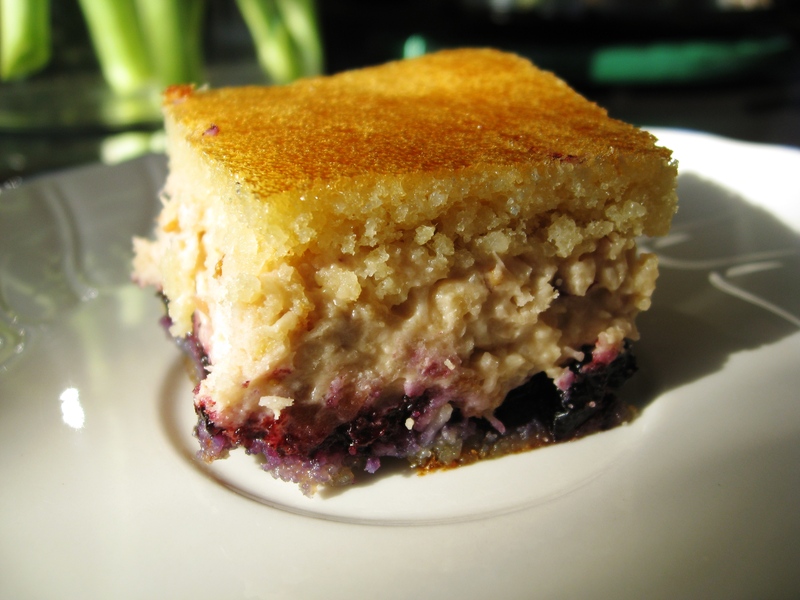 Today’s featured Primal dessert is for butter lovers – actually we should have called it Butter Square Delights :-). The filling as you can see is primarily pastured butter; whipped creamy with a beautiful egg yolk some raw honey and chopped up nuts and figs. Oh boy…naughty. You will need a 13 x 9 x 2 non-stick baking pan, and pre-heat oven to 400 °F. In a mixing bowl, combine 4 eggs, 1/2 pinch of sea salt, 3 tbsp honey, vanilla, 3 tbsp brewed black coffee (optional), and blend with a mixer until very creamy and frothy. Then gently blend in almond flour and baking soda/powder. Pour into baking pan and bake for 10 minutes, remove and carefully cut in half horizontally. Whip butter, 1 egg yolk, 1 tbsp of honey, 1 tbsp vanilla extract until smooth and creamy. Then add 5 tbsp coffee (optional), figs, dried pomegranate/cranberry mix, and walnuts. Mix well, and add coconut flakes until mixture is consistent. Distribute 4 tbsp of low sweetened homemade blueberry jam on one half of the baked mass. Cover with filling using a Dough Card. Then carefully lift second half on top of the other. Carefully cut into 32 squares, and refrigerate for 30 minutes and serve. This dessert looks tasty and I can’t wait to try this out. I don’t understand why certain paleo enthusiasts get bent out of shape over a paleo/primal dessert. Eat whatever primal dessert you want to eat, excercise, and keep all things in moderation and you’ll be fine. Thanks for the wonderful recipe!